NIMSAT partially funded the UL Lafayette Police Department’s 33-foot motor coach, which is designed and outfitted to serve as a command center for University leadership in any crisis. NIMSAT offers extensive planning, training, and exercises in emergency response, ensuring your organization and community are safe in the midst of a crisis. Thank you to Congressman Clay Higgins for visiting Abdalla Hall to learn more about our latest research and tools for emergency management including a tour of the Louisiana Business Emergency Operations Center. NIST and US Ignite have created the Global City Teams Challenge (GCTC) to serve as a platform for local government representatives and technology solution providers to develop solutions designed to address vexing municipal problems with smart city applications. Michael Dunaway is the chairman for technology development and integration for the Smart Public Safety national super cluster connected to communications and the Internet of Things. The challenge is what will public safety look like in the future? The NIMSAT Institute showcased the NextGen Business Emergency Operations Center, a customizable version of the successful Louisiana Business Emergency Operations Center that was established in 2010. Louisiana National Guard Brigadier General Lee Hopkins and members of his team visited Abdalla Hall on February 24, 2017 to learn more about UL Lafayette's research portfolio. NextGen BEOC Project Named "Most Likely to Have a Big Impact." Dr. Michael Dunaway, Ph.D., Director, NIMSAT Institute accepts an award for the NextGen BEOC project named "Most Likely to Have a Big Impact" at the US Ignite Smart Cities Innovation Summit in Austin, TX. Major General Glenn H. Curtis, Adjutant General, Louisiana National Guard visited UL Lafayette's Abdalla Hall to learn more about ongoing research projects in the areas of disaster management and cyber security. He also visited a an architecture class that is working on a Camp Beauregard project. He is responsible for the deployment and coordination of programs, policies and plans affecting the more than 11,500 members of the Louisiana Army and Air National Guard. Dr. Ramesh Kolluru, Vice President for Research, Innovation and Economic Development accepted the US Ignite Smart Community award at the Smart Cities Innovation Summit in Austin, TX in June. Lafayette is one of 15 charter members of the Smart Gigabit Community. The project will jump start a growing and sustainable testbeds and corresponding applications delivering new advances in health care, education, disaster management and other national priority areas. The National Incident Management Systems and Advanced Technologies (NIMSAT) Institute is a homeland security and emergency management center part of the Informatics Research Institute at the University of Louisiana at Lafayette. The Institute focuses on the development of public-private partnerships and the application of advanced information technologies to enhance the resiliency of the US to all-hazards, and to the mission of saving human lives. The NIMSAT Institute seeks to enhance national resiliency to a full range of potential disasters by conducting research leading to innovative tools and applications that empower the homeland security and emergency management community through education, training, outreach and operational support. The NIMSAT Institute is staffed with experienced first responders, academic researchers, and technology experts connecting for a resilient America. 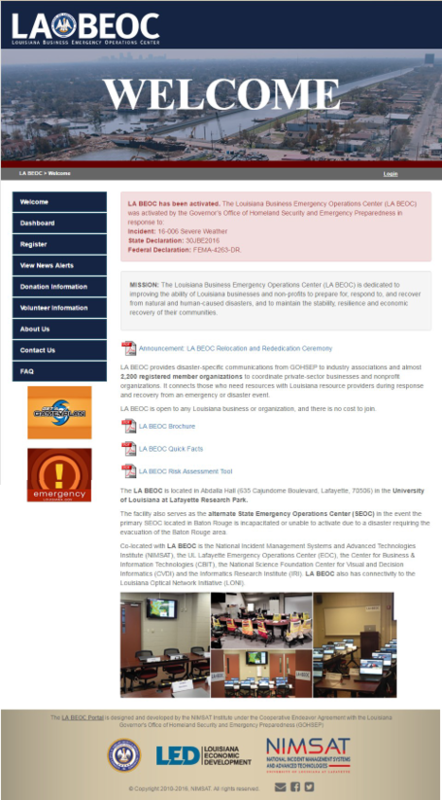 The LABEOC is a joint partnership between the Louisiana Governor’s Office of Homeland Security and Emergency Preparedness, Louisiana Economic Development, and the NIMSAT Institute at the University of Louisiana at Lafayette. Founded in 2010, the LABEOC supports the coordination of activities and resources of businesses and volunteer organizations in Louisiana and across the nation as well as with the public sector to improve response, improve self-sufficiency, reduce reliance on FEMA and other federal assistance in order to maximize business, industry and economic stabilization, returning the business environment to normal operations as quickly as possible. Currently, the NIMSAT Institute is creating a Next Generation Business Emergency Operations Center (Next Gen BEOC) with funding through the National Institute of Standards and Technology and US Ignite. Visit www.labeoc.org to register your business or for more information.